Two-phase orthodontic treatment is a specialized process combining tooth straightening and physical, facial changes. The purpose of two-phase treatment is to maximize the opportunity to accomplish the ideal healthy, functional and aesthetic result that will remain stable throughout your life. The goal of Phase-One treatment is to help the jaw develop in a way that will accommodate all of the permanent teeth and improve the way the upper and lower jaws fit together. Children often exhibit early signs of jaw problems as they grow and develop. An upper jaw that is growing too much or is too narrow can be recognized at an early age. 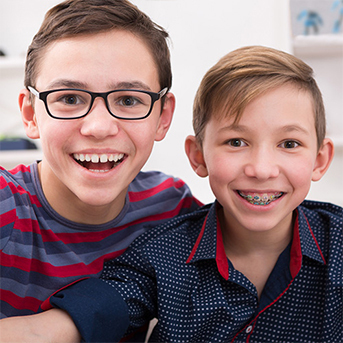 If children over the age of six are found to have this jaw discrepancy, they are candidates for early orthodontic treatment. Also, if children around the age of eight have crowded front teeth, early treatment can prevent the need to extract permanent teeth later. At the beginning of the first phase, orthodontic records were made and a diagnosis and treatment plan was established. Certain types of appliances were used in the first phase to correct and realign the teeth and jaw. The second phase begins when all permanent teeth have erupted, and usually requires braces on all the teeth for an average of 12-15 months. The treatment time for Phase Two is most often greatly reduced when compared to when Phase One was not performed. Retainers are worn after this phase to ensure you retain your beautiful smile.